When Comic Books Ruled the Earth: Whither Micronauts indeed! Noel Murray and I must have had very similar childhoods. We both got into the Micronauts toys, but neither of us had very many of them. I had a few of the more generic-looking (and more importantly, cheapest) figures and one of the vehicles. Eventually I traded with a friend for an Acroyear whose metallic parts I promptly painted red. I'm just establishing what everyone already knows: I am the supreme Micronauts comic book nostalgic on the web. Well, I know it because I'm the kind of jerk who knows things like that, things that make me out to be the kind of jerk I am. Others may know more, may show more devotion but I... Okay, I'm a sham. A fraud. I admit it. But I do love me some Micronauts toys. 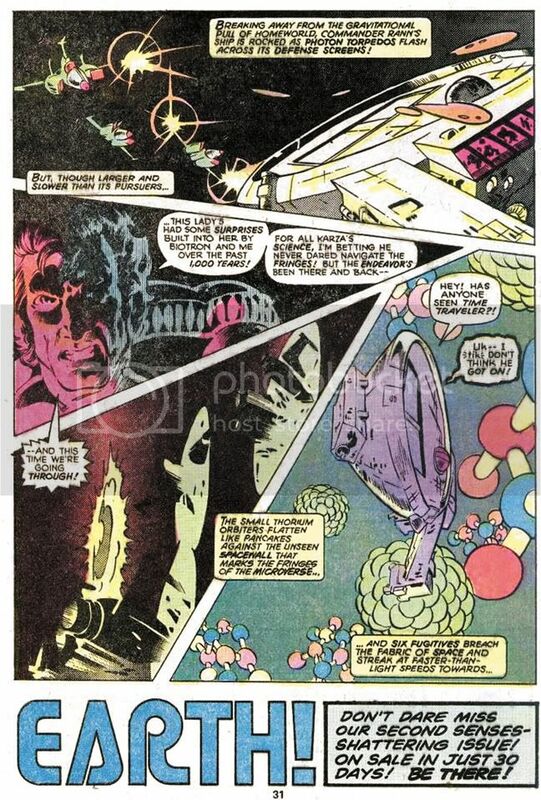 And I especially love the old Micronauts comic. Murray just wrote a short think-piece on how the Micronauts' place in pop culture is currently occupied by something of a void. There's a fan base out there, but as a property, Micronauts is stone dead. Or at least comatose. Meanwhile, new Star Wars figures hit the toy store shelves at an alarming rate, even of characters appearing for nanoseconds in the movies or cartoon shows. Of course, these characters all have backstories of their own now thanks to the exponentially increasing Star Wars narrative, but the point is they exist and thrive while our beloved Micronauts barely register on the cultural radar even for jaded hipsters whose entire frame of reference consists of ironic nostalgia for things they may or may not have had as children. 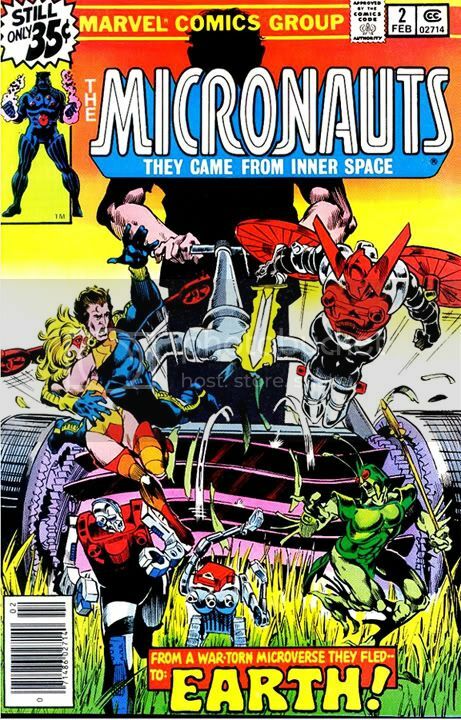 I've wondered, much like Murray, why there hasn't been a Micronauts reprint book. The first twelve issues of this comic comprise an almost forgotten classic. Bill Mantlo's epic, sprawling tale takes the toys and provides them with a surprisingly rich milieu made of parts lifted from here and there and artfully combined. Michael Golden's art is better than a comic based on a toy line deserves. While the one we got was certainly fun in a campy sort of way, Micronauts was the Star Wars comic we all really wanted. And like Murray, over the years I've done some research and it seems the rights are a bit too entangled for a proper reprinting. What we have here is a toy line from Takara Tomy Co. Ltd. licensed in the US by Mego overlaid with characters owned by Marvel or, ultimately, Disney. The in-house characters created by Mantlo still appear from time to time in Marvel comics, but they're now known as the Microns. Someone else-- Takara or perhaps the mysterious entity known as Abrams/Gentile Entertainment-- owns other key characters like omniscient exposition-provider Time Traveler, robotic comedic relief team Biotron and Microtron, the heroic warrior-king Acroyear and arch-villain Baron Karza. While working out some kind of financial and legal arrangement that probably isn't worth the money or effort, a would-be Micronauts reprint publisher faces a battle along the lines of reassembling the complete Beatles. I mean back in the 1970s when there were still four of them. Difficult though it may be, I doubt putting out a Micronauts reprint would be nearly so daunting a task as putting the Beatles back together these days. In the meantime, other comic book companies have taken up the Micronauts license and attempted to recreate the magic, only to fail. There may be a movie version in the works, and possibly some new toys from Hasbro, but I wouldn't waste time making plans to camp out for tickets or hassling the stockers at your local Toys-R-Us just yet. However, should the movie happen maybe-- just maybe-- someone will find a way to cash in with a reprint of the Mantlo-Golden book. Or maybe some well-connected superfan with more money than common sense will somehow make this happen. After all, Bill Sargent once offered the Beatles fifty million dollars for a reunion. We must have had the same childhood. I remember buying the toys, watching the commercials. The bizarre Karza/Horse -- and the comics. Reading those in a circle of friends. The sequence in the skate park! Amazing. And being aware of Michael Golden after that. The next big thing of his that I became aware of was Avengers Annual 10 (Ms. Marvel gives the Avengers a rasher of sh*t, and Rogue is unleashed upon the world). Then Nam. Am I mixing up the order? Anyway. Great piece. BTW, I tried to order your crazy Kirk print from DA, and the order ended up being canceled. That's a drag. Love your blog. Thank you, thank you! That's very much appreciated! I'm pretty sure that's the order. Golden's amazing. Thanks for trying to order that Kirk thing-- DA isn't allowing me to sell it. Something about the copyright or trademark. I should have known better!